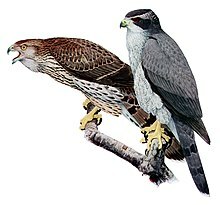 The Goss (frae Auld Inglis: góshafoc 'guiss-hawk'), Accipiter gentilis, is a medium-lairge bird o prey in the faimily Accipitridae. It is fund athort the temperate pairts o the northren hemisphere. Wikimedia Commons haes media relatit tae Accipiter gentilis.